Bryston has provided details on its new bookshelf speaker, the Mini A. This three-way speaker features a 6.5-inch aluminum woofer, a 3-inch aluminum midrange driver, and a 1-inch titanium dome tweeter in a cabinet that stands just 15.5 inches tall. The Mini A is available now in three finishes, and it carries an MSRP of $1,200/pair. Bryston has announced the introduction of the Mini A loudspeaker, a high-performance three-way bookshelf speaker engineered for superb resolution and balanced off-axis response--a hallmark of all Bryston loudspeaker models. At just over 15 inches tall, the Mini A features a sleek, décor-friendly form factor made sturdily from 0.75-inch MDF and utilizing a premium quality 6.5-inch aluminum woofer, 3-inch aluminum midrange and 1-inch Titanium dome tweeter. All drivers are designed and purpose-built specifically for the Mini A loudspeaker. The Mini A design has benefitted from extensive enclosure vibration analysis, crossover network refinement and anechoic chamber testing in order to deliver true high-fidelity at an affordable price. Like all Bryston loudspeakers, the Mini A is capable of high output levels without introducing distortion or compression into the listening experience. Each pair is unit-to-unit matched to ensure uniform response. The Bryston Mini A is an ideal home theater speaker. Two pairs of Mini A loudspeakers (front and rear) combined with an AC-1 Micro center channel and the Model A subwoofer deliver Bryston performance in a complete 5.1 loudspeaker package for under $5,000 MSRP. Also available is the Bryston CIW architectural speaker, a low profile timber-matched in-wall speaker solution ideal for home theater applications. The Bryston Mini A is available in Natural Cherry, Boston Cherry, and Black Ash. Custom finishes are also available for an upcharge. The Mini A features premium grade binding posts along with padded feet, spikes and a black fabric grille. Like all Bryston loudspeakers, the manufacturer's warranty is 20 years. The Bryston Mini A loudspeaker has an MSRP of $1,200 per pair and is available now from authorized Bryston dealers. Optional stands designed for the Mini A, which can be bolted to the speakers securing them in place, are available with an MSRP of $299 per pair. • Bryston Introduces the Model A Subwoofer at HomeTheaterReview.com. 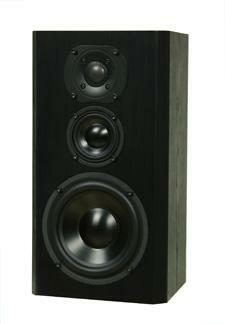 • Bryston Middle T Floorstanding Speaker Reviewed at HomeTheaterReview.com.